A contemporary sanctuary does not dominate the believer, but rather invites him/her to contemplation. The design of the built volume, the choice of building method, the selection of materials elevates the space from its physical anchor. 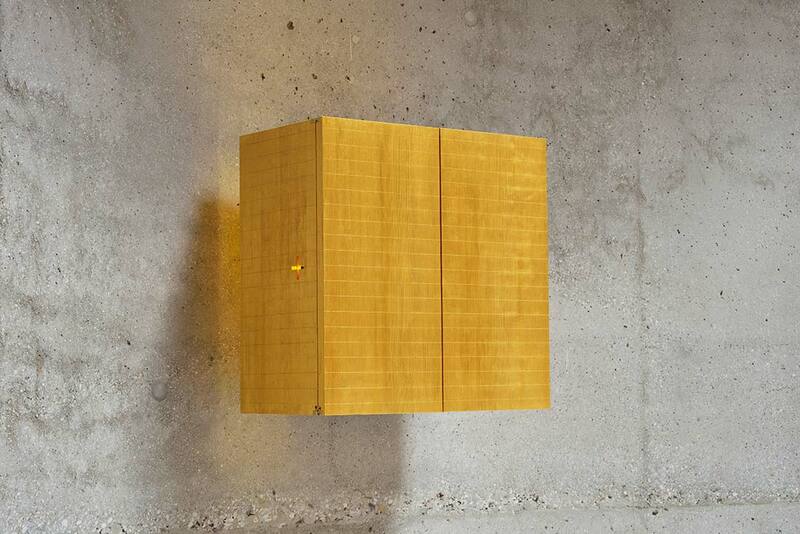 The intention to make interior light, a material that is harder than concrete started to emerge with a long process. 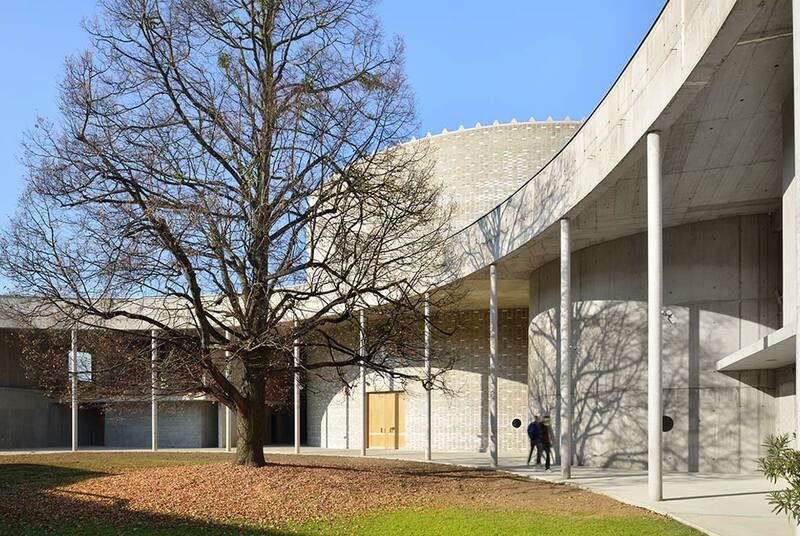 The Don Bosco centre in Maribor is the most important public architectural building of an urban area that is intersected by an arterial road and the western ring road on the south-west part of the city. 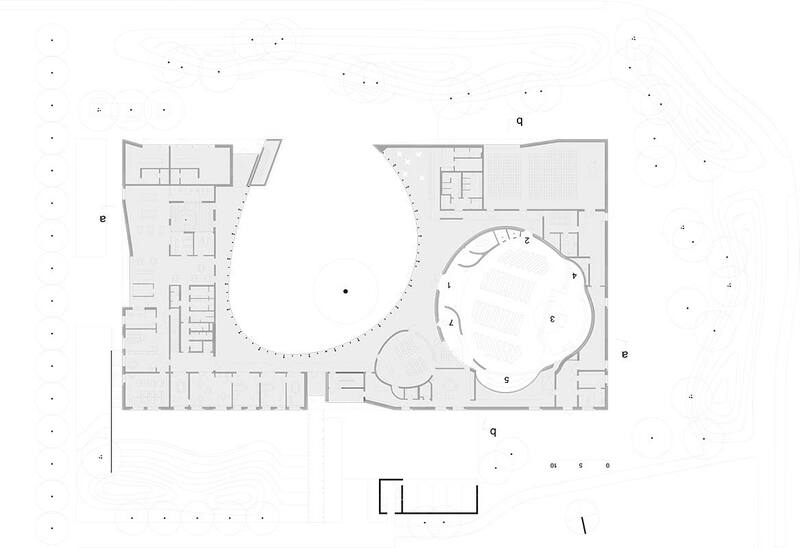 Surrounded by noise and chaotic design, neither of which are particularity suitable for a sanctuary, but this is the most densely populated area in the city, the complex has gradually established a convincing world of contemplation. The Religious Complex is designed as a closed building island, placed inside a small park, which protects the complex of two nearby roads. The building itself is a clearly articulated rectangular architectural mass with the nave and the bell tower rising above it. 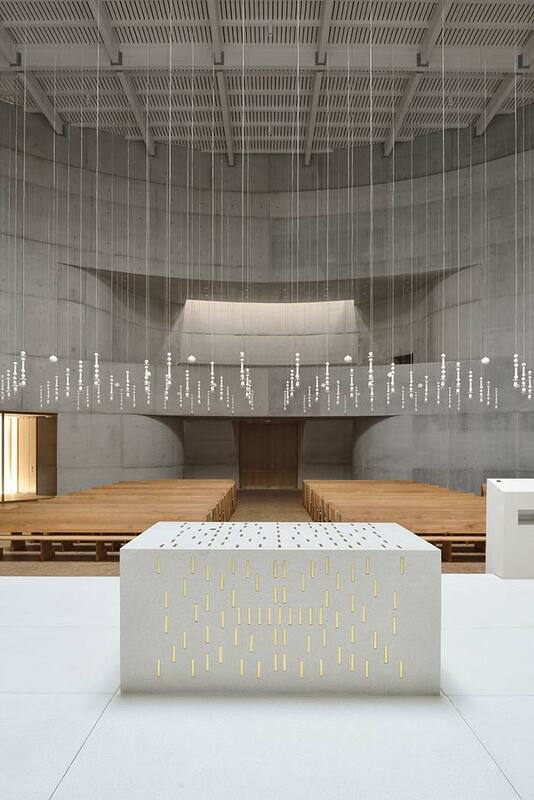 The atrium, the chapel and the church are a trinity of the most sacred and symbolically meaningful spaces, giving the sacral building a convincing symbolic power. The Church itself is the first completed part of the whole Salesian sacral centre. Upon entering the contemplative courtyard adorned by an old linden tree the church suddenly becomes visible across the portico. At a glance one can feel the extent of the nave from the ground over the roof of the lower part of the complex all the way to the cornice that represents a crown. The volume of the nave is set into the structure of the lower one story building. The shape of the nave is derived from a triangle with rounded corners and sides. The nave is the place for introverted contemplation therefore the only view out is towards the sky. The most sacred place is thus marked by an intense experience of light. 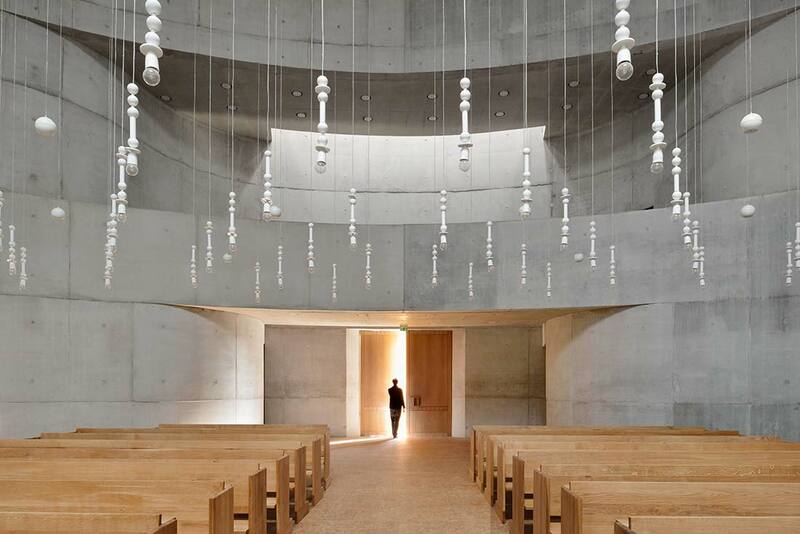 We used different qualities of light in order to accentuate the hugging shape of the nave. We choreographed a play of light: vivid natural light emitting from the round skylight interferes with diffused light of the nave. More soft natural light is coming from behind the presbytery and the rear choir. This simple yet so complex design allows the building to transcend its physical presence, becoming a mere container of light. 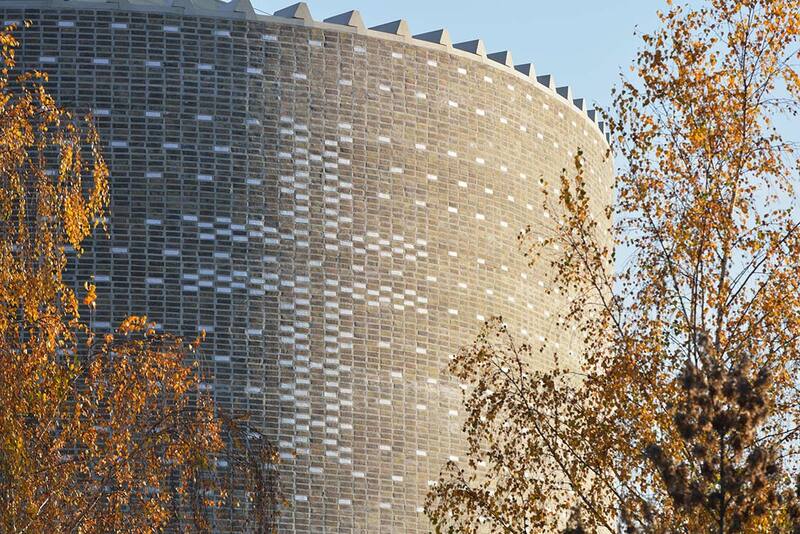 The concrete walls of the nave, nesting in the orthogonal built volume, are clade on the outer side with specially designed brick cladding composed of vertically structured sequences of bricks forming seven crosses bade of white gazed bricks. 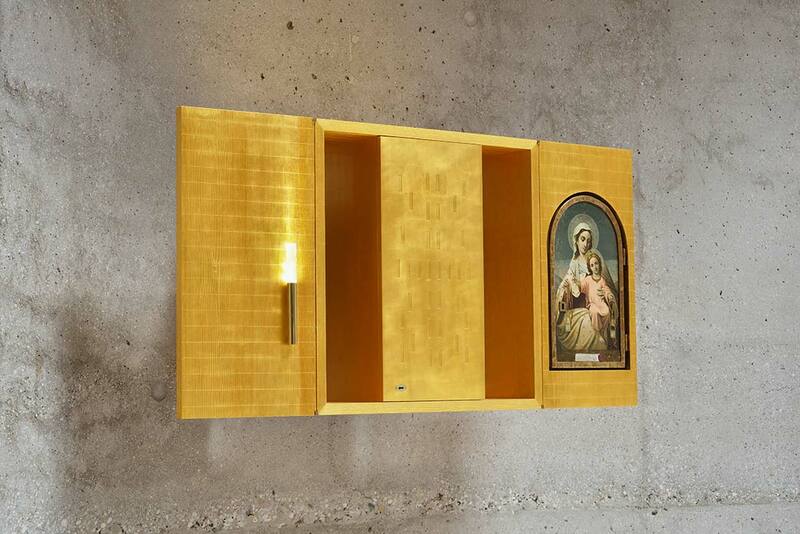 The church is in materiality very simple, uses very clear and honest materials like exposed softly shaped concrete, and wood that is treated with oil and nothing more. The oval perimeter of the nave features horizontal lateral recesses that induce a feeling of peaceful rotation around the central oculus. The church seats 300 people on wooden benches. The floor below is covered with massive oak wood floor. The horizon of the interior is defined with light mesh of one hundred handcrafted snow-white lamps made of clay, which consist of five compositional elements. 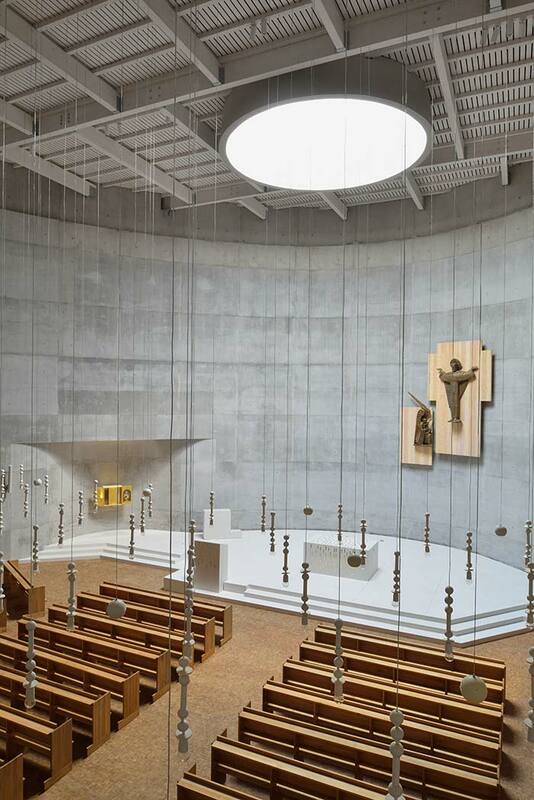 The warmth of the introduced materials such as oak wood and clay lamps create the impression of safe haven for the congregation. The natural decoration of church nave is created by different uses of light, from the “God’s eye” above the presbytery, to the zenith light spreading across the walls from top to bottom.